Andy Robertson has joined the ranks of players at Liverpool who have signed new deal, putting pen to paper on a five-year contract on Thursday. The left-back has quickly become a fan favourite on account of his all-action style, his great delivery in the final third and his willingness to fight for the cause. Considering he wasn’t even in the team on a regular basis as little as 15 months ago, his meteoric rise has been incredible. 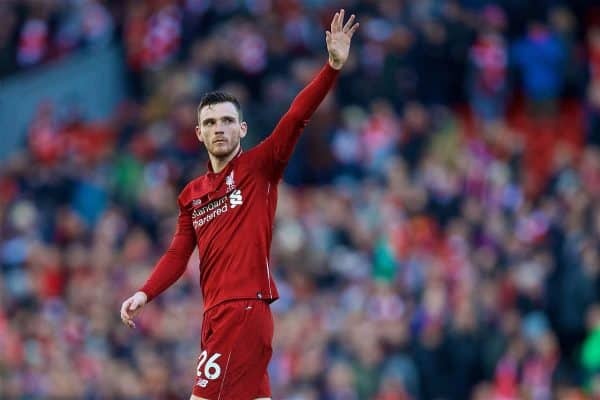 Now seen as one of the best left-backs, certainly in the Premier League and likely much further afield, Robertson should only go from strength to strength as he remains at Liverpool for the long term. Even with just 56 games under his belt at the club so far, he already has a highlight reel which would put most seasoned veterans to shame; here’s a look back at five of his greatest moments so far. 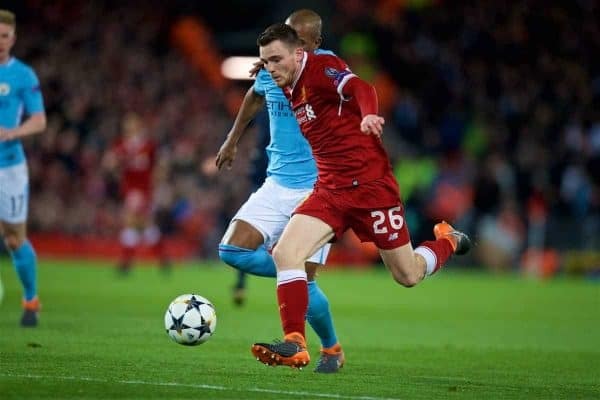 He might not have started the season in the team, but by the time an unbeaten Man City visited Anfield last January, Robertson was an indispensable starter. 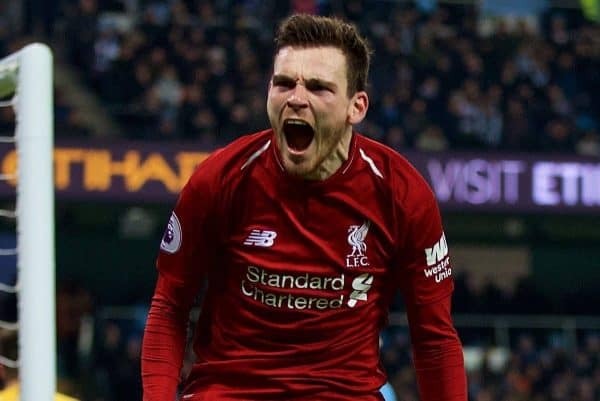 Perhaps his most iconic moment to-date came against in the Premier League encounter, with the Reds working hard to stay 4-1 up and City trying to control possession in the Liverpool half of the pitch—but they reckoned without Robertson’s work rate and stamina. The No. 26 embarked on a quite breathtaking lone press, closing down no less than five players including City’s goalkeeper. In the end, City were fortunate to escape with a free-kick but Robertson had gained the Reds about 60 yards and they went on to win the match. 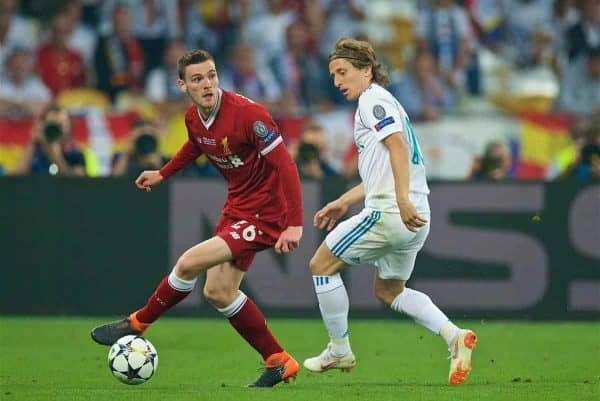 A big part of the Reds’ surge through Europe, Robertson lined up in the Champions League final last term. His story of going from the Scottish lower leagues to the pinnacle of European football is an incredible one, but it’s easy to see how it happened with his determination and team work. Those traits were fully on show in a key moment in the final, with Real 2-1 up and the Reds pushing for an equaliser—allowing Cristiano Ronaldo to break through space into the box. He might have thought he was about to score, but Robertson produced a quite magnificent recovery tackle to keep the Reds in the game. 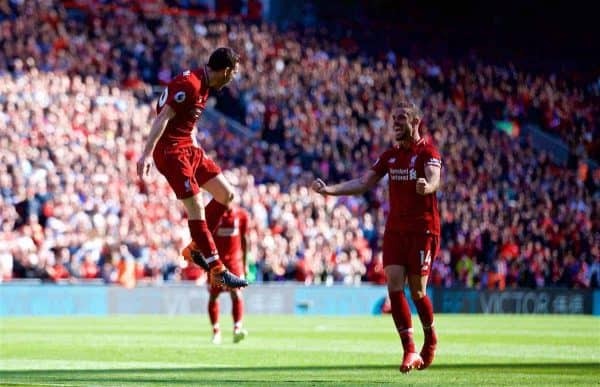 Despite being offensive-minded in his play and regularly getting forward to good effect, Robertson’s primary role in attack is that of a supporting player. Thus far he hasn’t been in a position to score too often, though he might have done better on a couple of occasions this term. His first, and so far only, goal for Liverpool came on the final day of last season, smashing home a left-footed effort from close range after a close was deflected his way. The celebrations which ensued showcased his feeling for the team and it’s little surprise he’s become such a fan favourite. Liverpool absolutely blitzed Man United at Anfield earlier this season, running out 3-1 winners but, in reality, being the far superior side on the day when the scoreline didn’t do justice to the gap between the teams. Robertson was a stand-out performer yet again on that occasion and his tireless approach was highlighted after the final whistle. It wasn’t a team-mate or even Jurgen Klopp who brought it up, though, but opposing manager Jose Mourinho. Just another great performance from our left-back. The Reds might have lost 2-1 at Man City at the start of the year, but they remain clear at the top and their approach on the day showed there is very little between the sides. Indeed, Liverpool’s goal to initially equalise was a majestic creation, of which Robertson provided the final pass: a perfectly weighted, first-time ball across the face of goal, for Roberto Firmino to head home. That was Robertson’s fourth league assist of the season—putting him back ahead of Trent Alexander-Arnold, on three. The two full-backs have a friendly, but competitive, bet going on who can create the most goals for the Reds this term, and it’s the Scottish international captain who currently has the lead!